Connector backshells, adapters, protective covers, cable clamps and other accessories from leading trusted OEM's including Compaero, Amphenol and Glenair. The adapters range from simple strain relief’s to submersible EMI/RFI shielded backshells for use in harsh environments. To safeguard connectors whilst they are not in use we provide protective covers with a wide range of lanyards, eyelets and security rings enabling complete customisation. Our line of MS3057 cable clamps are extensively used in automotive and heavy industrial markets and are available in a multitude of finishes. For d38999 III we now assemble backshells for Compaero. Please contact the team for more information. Contact the team today for a free quote! Looking for the correct d38999 backshell? Non-Environmental connector backshells are used when there is a requirement for additional space between the rear of the connector and the strain relief. This allows for cable service loops, jumping, filter networks, etc. They provide a mechanical strain relief for non-environmental applications. Environmental connector backshells protect the wiring side of the connector from dust, dirt, moisture and fluids. 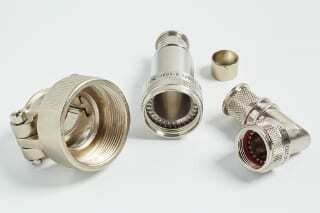 Almost all recent Military specification circular connectors are designed so that when the wires are inserted through the grommet the connector will be environmentally sealed once the backshell or strain relief is secured (assuming all holes in the grommet contain either a wire or a sealing plug). Backshells for Military and Aerospace applications are governed by the SAE and the now ratified AS85049 standard. All existing M85049 documents have been superseded by the new standard. AS85049 backshells are coupled to the rear of the connector body to support and strain relieve the cable entry to the rear of the connector. Strain relief clamps are available in either straight or 90 degree variants. Coupling is either self-locking or non self-locking. We provide Government QPL manufactured M85049/128 Termination Bands. These bands are commonly used to attach a braid or a shield to a backshell to provide EMI/RFI shielding. They are available in different lengths, widths, and styles. Our Termination Bands work seamlessly with Daniels Tooling. Our MS3057 style cable clamps have MS 'V' threads that will provide strain relief for MIL-DTL-5015 Solder (style A) connectors. These clamps are used in the automotive and heavy industrial markets. They are available in a wide range of finishes including Cadmium Olive Drab, Electroless Nickel, Black or Green Zinc Cobalt and more. Bushing of synthetic rubber to be used with cable clamps for protection of the cable or wires. Generally for use with MS3057 Clamps. Our full line of protective caps / sealing caps provide moisture and dust protection for almost every circular mil-spec connector. Available with a wide selection of lanyard types and lengths. Security rings and eyelets of all sizes are also available. We can provide a unique re-enterable termination system for connecting a cable shielding braid to a circular connector. When used in conjunction with a heatshrink moulded shape, a sealed environmental termination system is achieved. The main feature is that the termination can be re-entered when required. It is thereby possible to effect repairs to connector pins/sockets without the need to discard any part of the shielding system. Due to the self-tensioning nature of the spring, it provides excellent resistance to vibration and shock. Predominantly used in the Aerospace, Defence and professional electronics sectors. Your project will not be complete or meet the requirements of your end customer specifications unless they are provided with the correct compatible connector accessories. Don’t forget to ask NYK Component Solutions to define and quote the correct circular connector backshell and accessories for your application.